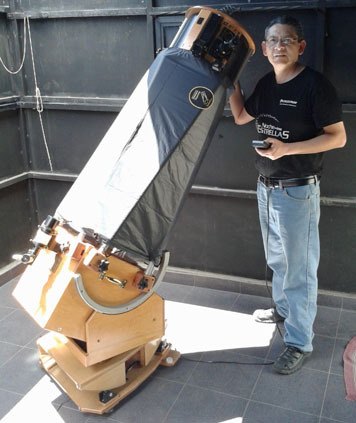 Paulo Estrada of Mexico recently took delivery of a Dual-axis Platform for his 12.5" Obsession Telescope. The Platform was finished to match the stain of the scope itself. Mr. Estrada is using this powerful combo to do excellent high-resolution Lunar and Planetary imaging. 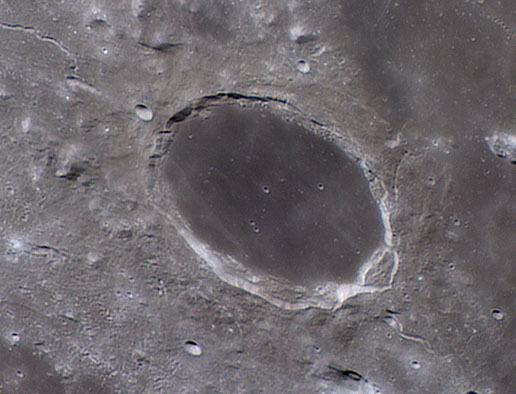 Here are two examples of his work -- a stunning closeup of the crater Plato on the Moon, showing an incredible amount of detail on the crater floor. The other image is a beautiful colored and detailed capture of the belts, festoons and Great Red Spot on Jupiter. "Id like to offer a heartfelt thank you for the excellent Dual Axis EQ platform that you crafted earlier during the year. It works incredibly well! I was able to obtain some magnificent views at the TMSP and Merritt Star Quest (held in the mountains of BC, Canada) with the Teleport 12.5 / Osypowski Dual Axis EQ Platform combination over the summertime and fall season! In fact, the Platform tracks so well and the sample astro photos that appear on your website are so compelling that I am very tempted to try some astro photography next summer. Your Platform is so well crafted that it encourages the owners to attempt to do things that would normally be considered impossible with a Dob. Such becomes possible when one does not have to worry about Platform management issues when using it in the field." The full text of Bob's comments can be found here. 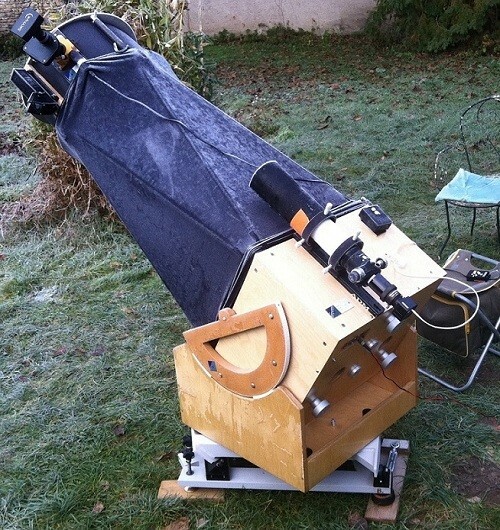 Yann Le Gall from France has been using a Dual-axis Aluminum Platform with his 15" SkyVision Dobsonian to take some truly amazing planetary and deep sky images. Mr. Le Gall uses narrow band filters and long exposures to get some unusual images like this one of NGC 6888, which is a combination of two hours with an Ha filter and two hours with an OIII filter! "I tested EQ platform last night finally. The night sky of Korea was terrible for almost over a month because of a long rainy season. I was surprised by the performance of platform. The object was at center of view for a almost one hour ! and polar alignment tool was simple and easy but very precise! It was a new experience in my astronomical observing life. I was really satisfied with your platform and thank you again." 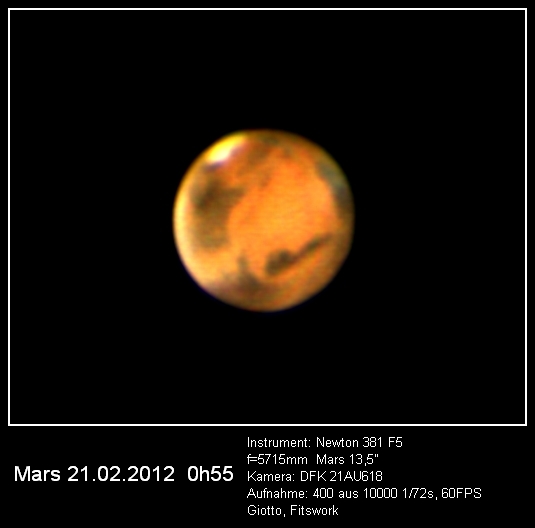 I am sending this first picture of Mars from this evening. It is really not perfect for 15", as I did not have the right image scale, but I will improve I´m sure. Thank you Tom for your very fine work. In near future I will start with deep-sky photography and send you a report." 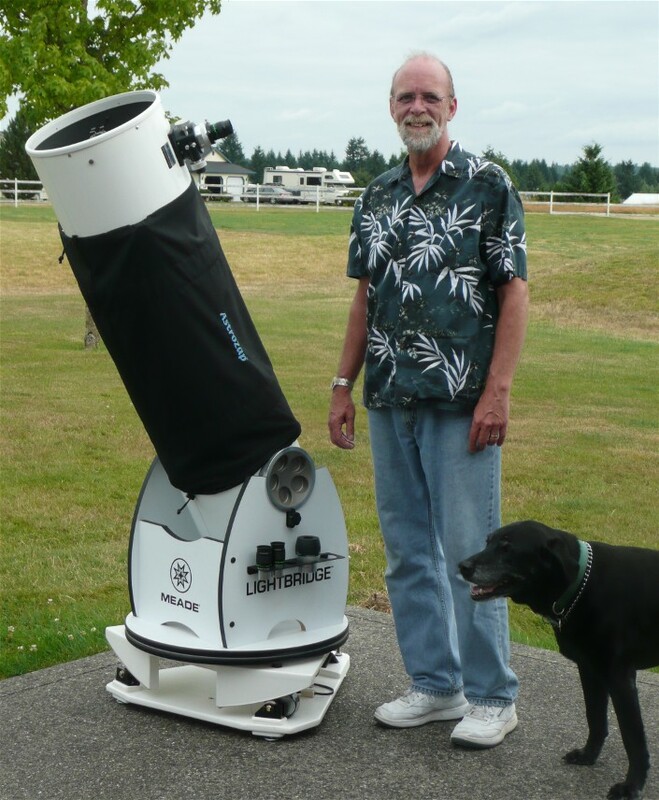 Don Morris with Chloe and the new Compact Platform for his 12" Meade Lightbridge. It looks great, setup was a snap, and the customizations for the Lightbridge are spot-on. Even better, the weather cooperated just enough to take it out for a trial run. I just pointed the platform roughly north, leveled it out, and set the telescope on it, turned it on and I was tracking. What a wonderful experience to center the Double-Double at 315X and have it just stand there in the field of view. Walk away from the scope for 15 minutes, come back, and the image is still perfectly centered. The platform is going to make a huge difference in the quality of my observing. "I've had a couple more nights out with the platform. In particular, I got out the other evening to look for the supernova in M51. The platform allowed me to spend the time relaxing and viewing instead of chasing. As a result was able to see knotty detail in the galaxy I have not seen before as well as the supernova as it slipped in and out of view. An awe-inspiring scene. It really is true that using the platform is like adding a couple inches of aperture." 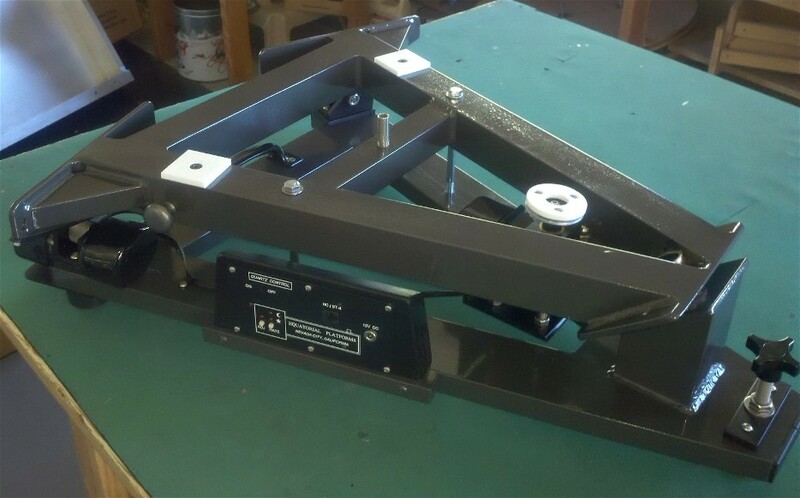 "I've been using the aluminum dual-axis platform you built for me for more than two years now. As you may recall it was originally designed to work with my 10" F/6 Newtonian, which had been mounted on a classic Dobson base. 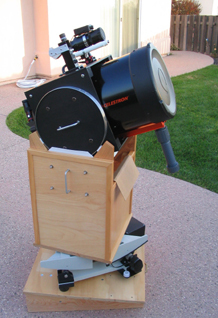 The equatorial platform was essential in permitting me to perform imaging with a CCD camera, and I have used it with my 8" Newtonian as well. Last year it occurred to me that I could also use the equatorial platform with an 11" S-C tube assembly if it were held in a Dobson-type altitude bearing fixture. This turned out to be easy and very successful. The attached photos show how this is done. On the aluminum equatorial platform I place the oak Dobsonian azimuth base I've always used with my Newtonians. The C11 tube is held inside a new lightweight rectangular adaptor box of 1/4" plywood fitted with an oak dovetail to grip the dovetail rail extrusion provided by Celestron on the bottom of the C11 tube assembly. My adaptor box was made exactly as wide as the altitude bearing box on my 10" Newtonian. On opposite vertical sides of the box I attached circular altitude bearings like the ones on the Newtonian. A small counterweight was mounted on the lower front of the C11 dovetail rail. The top panel of the adaptor carries a 9X50 finder scope, a green laser, and a Rigel Quickfinder sight. This arrangement is physically easier to set up than a conventional tripod mount for the Schmidt-Cassegrain, and the seated position for the observer is comfortable. The lower inside of the old Dobsonian base provides convenient storage for eyepieces and other items during an observing session. Because of the setup convenience and the accuracy of the platform this instrument now is the one I use most. I try to observe with it whenever our weather permits." "Attached some first results of images that I made with my 40 cm F/5 dobson with your Dual-axis Equatorial Platform. I'm totally happy with its performance. Set up is easy, polar alignment is done very quick with the Polar Alignment Tool and tracking is very smooth. Couldn't be happier! By the way, I had some very positive reactions on this Platform during the starparty earlier this month. 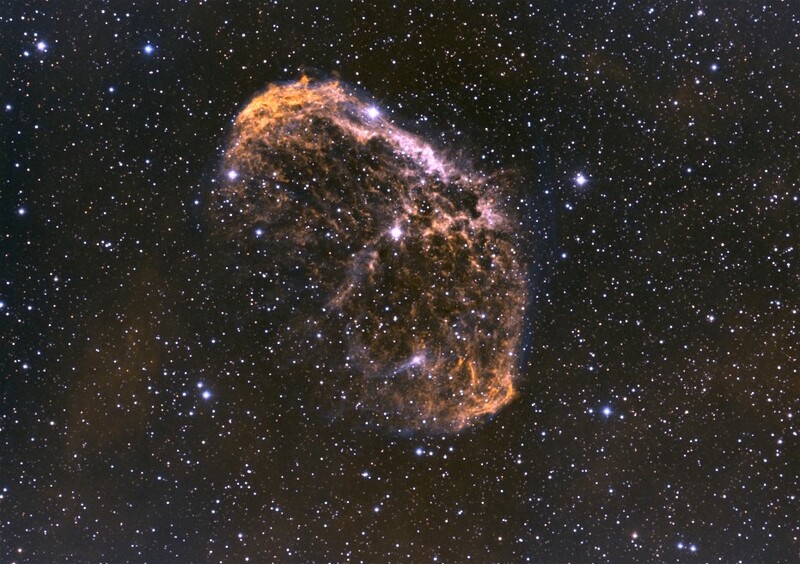 It's a joy observing with 800x while the object remains centered in the field." 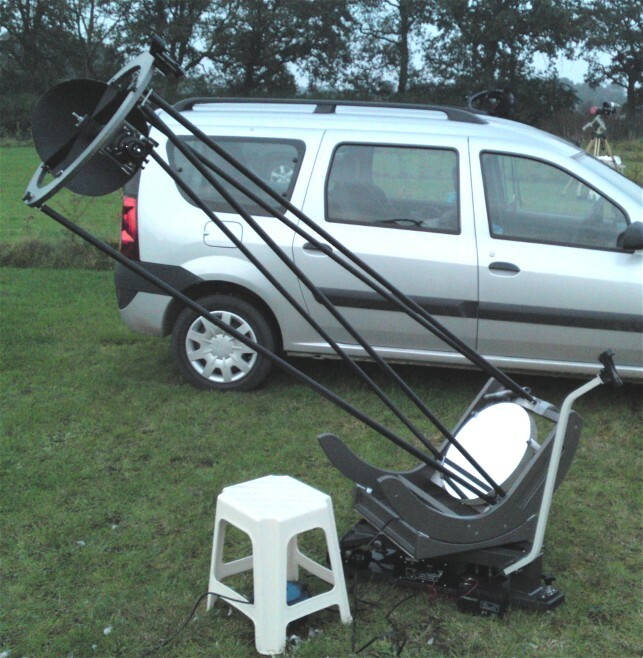 "I have completed some viewing sessions with my new compact equatorial platform (built for my 10" Orion Intelliscope), and the platform is working great. It adds significant value to your viewing experience by allowing time to study an object with no pressure to keep manually moving the scope. Your eyes are able to adjust and object details reveal themselves as never before. Thanks for your attention to quality and detail." Unit arrived safe and sound. Looks great! It was actually clear the night it arrived - tried it out and it worked flawlessly. It was such a joy to be able to turn it on and have it work with no fiddling around. Quiet and smooth performance - thanks for a great product! I really appreciate you taking the time to get the base from Mag-1 and install it. It was a lot of fun to be able to slew around as usual and have the scope stay on target wherever it was pointed." Thought you would like to know that your platform is precise, accurate and a pleasure to use. There is also something almost magical about preserving the manual - nothing to engage or disengage - mechanical simplicity of a large Dob, while simultaneously tracking with dual axis slow motion control." I want to thank you for the excellent equatorial platform that you recently shipped to me. The unit looks like a piece of art. Every detail of its appearance is very professional looking. I noted that every extra item that I asked for was designed and installed in an elegant way. I am very impressed. I have taken the unit out for a test run. Every aspect of it works like a charm. I am very pleased with it. I would recommend your units to anyone who wants to have an equatorial platform that is very sturdy, beautiful and which performs without a flaw. I have enjoyed doing business with you." Thank you for making a masterpiece! My new 18 Compact Equatorial Platform is absolutely what I wanted and needed. It performed flawlessly last night, Saturn at just less than 500x was just breath-taking and never budged from the center of the FOV for over 20 minutes! Last night was a Public Open House for our club and being able to grab my scope and manually move it from object to object or what I refer to as point & shoot astronomy is the way to go. Its the way I learned and its my preferred method; add flawlessly tracking to that without having to release clutches or disengage belt-drives and it is the best of both worlds!!! Its great to be able to crank up the power and study those faint details for more than the few seconds that non-tracking affords you. I spent 15 minutes observing Arp 6 or NGC 2537 (the Bear Paw Galaxy) at 295x and was easily able to see the 3 toes of the paw. WOW! My observing buddy was so impressed with the design and workmanship, and the fact that it only uses one 9v battery that he will be calling you soon to make one for his 13 dob! Thank you again Tom!" seeing! Till now I used at max 800x on my 20"/5 dob. (3mm Nagler zoom + Paracorr). Due to the platform tracking last night, I was able to use a 2x barlow and still the stars would not dance ! Pease 1 at 1500x without OIII blinking, just identifing the planetary as a patch between the star at right and left. NGC 604 (1200x) in M33 showing additionally a number of individual stars or clumps of stars. Although Einstein's cross wouldn't resolve into members, just a bright core in the feeble host galaxy, it was nevertheless a great experience. Mars showing a wealth of detail for the 9" size diameter....The egg-nebula...it went on and on. Thanks again for your help all along to come to this happy end." 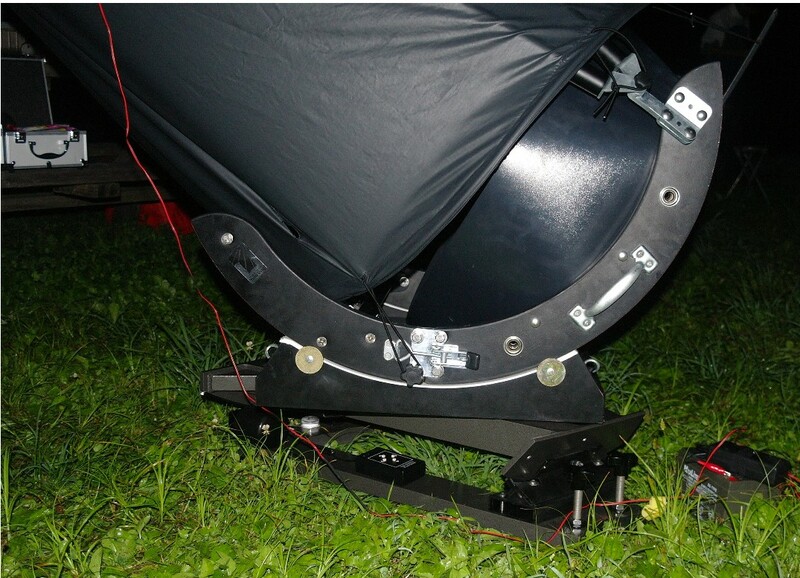 "After nearly two weeks of clouds I was finally able to use my new Compact Platform Tuesday night, and I can report that it works great! Even with very approximate leveling and pointing North by dead-reckoning, it tracked more than adequately for my purposes. It was great to be able to go into the house and return to find things still centered in the field of view. But more than that, I was staggered by the extra amount of detail I could see on Jupiter (and I just happened to catch an eclipse in progress). I felt that the increase in the amount of detail I could see was more than just being able to catch the moments of good seeing. I was used to that without tracking. Maybe just having the object stay still and not having to move my eye at all contributed to it. It was really quite striking. Of course on nights that support cranking up the power, the difference will be amazing. I think I will also, with the Platform tracking, be able to refine my collimation by using high powers on a star test. The azimuth motion of the scope is maybe even a little better than it was with the original ground board. By all means feel free to post my comments on your website. If people read them and decide to buy one of your platforms, they will be doing themselves a favor." "You made me a Compact Platform for a Starmaster 11" f5.4, a little less than a year ago. I had it out just last night, for the umpteenth time, and on a whim took it down to the street level (in Manhattan), and let passers-by take peeks at Saturn and Jupiter through the binoviewer. What fun, hearing the cries of sheer astonishment and delight. I have to say that your Platform just totally transforms the experience of using a mid-range dob. I've always had fun with it by myself, but even sharing it with one other person has always been a bit of a chore, particularly at the high powers you need for planet-viewing. Before, I had to jump in front of people and re-center it for every glance. Now I can easily share it with a dozen people, and I can spend my time talking about what they're seeing, as they line up to look. All of this without being very careful about pointing it exactly north, or getting it exactly level. And when I'm by myself, I can just take the time to look, which is priceless. If I'd understood all this, I would have bought the Platform as part of the scope. Thanks for all the fun." "I've wanted a high performance newtonian ever since I viewed through a friend's superb 10 inch equatorial. However, I needed a portable scope, which led me to a Dobsonian. It was your Platform that prompted my purchase of a Starmaster, which I have used now with your Platform for the past three years. The Platform has worked flawlessly and allowed me to enjoy the superior image quality of the Starmaster. The setup is easy (especially with the optional polar alignment unit power finder) and the tracking is sufficiently accurate to use with the Sky Commander computer/digital setting circle setup. When I polar align with the finder I don't notice any image drift for the period I observe the object. This is exactly what I want it to do and I have been very happy with it. I also find the build quality to be excellent and you did a good job of matching the finish of the Starmaster's oak." "Hi Tom, Well, I've had my Platform for about a month now, and I just wanted to let you know how it's working out. In a word, fantastic! Managed to get enough breaks in the weather to use it 7 or 8 times so far and it has performed flawlessly each time. I am very impressed with your workmanship and the fit and finish. Had it out for the first time at our monthly star party last night and everyone was very interested in the Platform and were all suitably impressed with it as well. I am very happy with the Platform and it is the perfect accessory for any dob." "I just realized that I had never gotten back to you to let you know how happy I was with the Compact Platform that you made for my Teleport. It works like a charm and I use it almost every time I set up the scope (which works like a charm too). 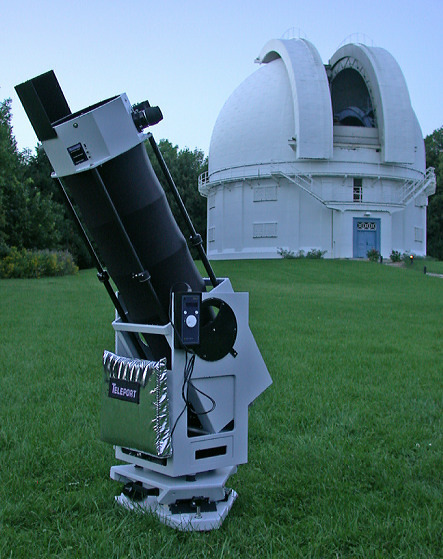 I've attached a picture which shows it set up just prior to a public viewing session on the grounds of the David Dunlap Observatory just north of Toronto. (The scope in the dome is a 74". ) The Platform has made it just soooo easy to share the views. That and the Zambuto mirror always brings comments like "I like that one the best" from both kids and parents. All in all, I am very grateful to you for having produced such a well-engineered product." "I wanted to tell you how pleased I am with my Dual-axis Aluminum Platform. I can use it either with my 13.2" Cass or my 15" f/5.5 Newtonian. I really appreciate how the wireless remote pad works for centering Mars in the field at high magnification. Thanks for a great product." simple sighting from the Polar Alignment Tool. Thanks for making such a great product." "First of all, let me say that the quality of the work appears to be absolutely first rate. Everything arrived well packaged and in good shape. The wood work and finish is the same high quality as in my Starmaster telescope, and even though the shade of the finish is a slightly different, the scope and platform look like they were made for each other (which they were). Set up is easy, and it only adds a couple of minutes to my normal set up time. I presently don t have the luxury of setting up the platform in the same location each time, but I have developed a way of getting the polar alignment reasonably close, and pretty quickly, so that there is no noticeable drift in Jupiter at 300x in my eyepiece. It is great to be able to just observe, rather than the push and drift, push and drift routine that I was doing previously. I have recently read of the user of a different platform complaining of some noticeable vibration with the tracking of another brand of platform, but the image with your dual axis platform is rock steady, even when the scope is placed on an elevated wooden deck. The platform performs and looks exactly as promised and does both at a very high level. Thanks again for the excellent quality product." "Our skies have refused to let us fire up your platform since receiving it several weeks ago. We had hoped to get out there for a test run prior to our public viewing scheduled for tonight. Several people planning to attend called to ask if we were still on. I looked out the window and saw only deep blue sky. I told them absolutely. What better way to honor 7 brave astronauts. I closed the store early and raced home to get everything set up. The platform was so simple to run and set up. Dad and I noticed how steady the sky seemed which is a rarity 1st night after a front pushes through. We set up on Saturn, turned on the drive and watched for any noticeable drift. None, so we stuck an 8mm in. No drift and tracking extremely well. Tried a 2 inch barlow and the 8mm and I have never seen Saturn so detailed, so sharp. The seeing was as close to perfect as I have ever seen here. Your platform is incredible, highly accurate, and very simple to operate. You have given our Dob a new life. And sent 12 people home very happy and excited to have been out here on this perfect evening." "I wanted to wait until I had a chance to use your Aluminum Platform under my 15� Obsession several times before I sent you feedback. 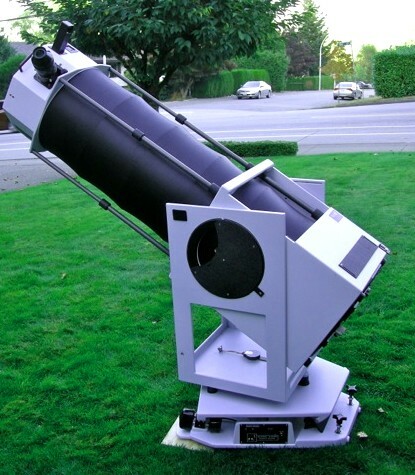 I have been to two local star parties with it and used it several times in my driveway. At the local star parties it was a showstopper. Everyone was impressed with the flawless tracking; no one had ever seen a finer quality platform. Ease of setup, low profile and buttery smooth operation make it a must have for any Dob owner. Viewing at high power is now the norm instead of the exception with your platform. 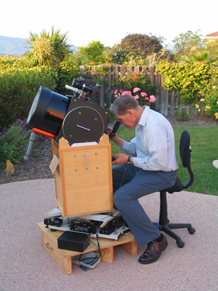 Thank you for making your talents and craftsmanship available to the amateur astronomy world." "After getting your e-mail, I got to work and successfully married the Equatorial Platform and the 15" Obsession together in the living room. It was sort of a test run. Then I broke down the various components into manageable units and moved everything out to the back yard and set everything back up. I started to view the Moon just to get a feel for how the system tracked. I had only a rough polar alignment using a set of bench marks on our patio roof. The Platform tracked the Moon for an hour with only a minor nudge about half way through. Eventually as it got dark I viewed Venus, M4, M22, M8, M57, Albireo, and M13. I can not believe how flawlessly, and quietly, the drive tracked everything. It is also amazing how smoothly the telescope can be moved in azimuth. The viewing pleasure with tracking is immense. You can be sure that I shall give unequivocal good endorsement of the platform at any star party where I see someone with a big Dobsonian using the nudging method. Thanks again for a wonderful product and the pleasure it gives to observing." "I haven't had a chance to write and let you know how pleased I am with my Platform until now. The first thing I noticed was how well you packaged it, labelled various details of the Platform with cards and arrows, and included both the wrench for the bolt and the battery for the hand controller! Wow, someone who thinks like me! The platform is wonderful and tracks very well. It is so nice to be hunting Herschel II objects without having to keep moving the scope back to my starting position! The platform is quite smooth and very quiet. Anyway, thanks again for such a fine piece of machinery." 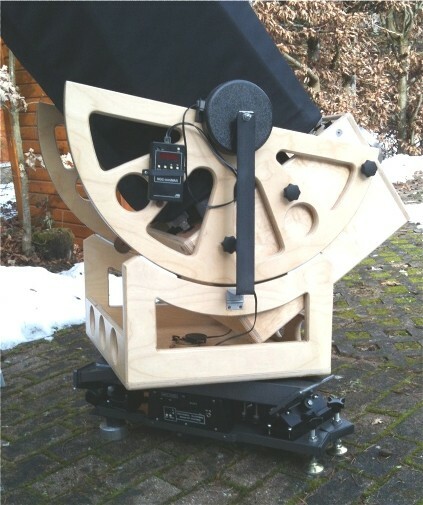 "I own a Tom Osypowski Equatorial Platform and I believe that it is one of the two ESSENTIAL "accessories" for dob owners (the other would be a Parracor). You're almost crazy not to have one. The Platform takes up minimal space, doesn't weigh a ton (like a German EQ), and is ready to go in seconds. And it also is much cheaper than a GEM that could carry your scope." "Tom, I had the new platform out for the first time this weekend, and wanted to let you know what a difference it made in my observing. The seeing was only so-so, but after only a casual eye-ball alignment with Polaris, Saturn stayed dead-center for as long as I wanted, and I was able to take advantage of the times when the air settled down for a minute or two and really see some detail. The whole night went like that; objects I would look at for a few seconds in the past, at low power, became available for prolonged study at magnifications as high as the air would allow. The best scope is the one you can use the most, and adding the platform hasn't changed the appeal of my 18". I can carry the platform with one hand, and it adds only about 90 seconds to my setup time, but it completely transforms the scope without changing the feel or stability at all. I knew the quality of your carpentry & electronics work before I ordered the platform, but I admit that I was surprised at the way it has changed what it is possible for me to see with my telescope. Thanks again for such a fine product." "I have not corresponded in awhile. Just thought I would let you know that I still own the platform that I bought several years ago. I use it every time I set up and the platform still performs flawlessly. It is as necessary to my viewing as the scope itself. The platform that I was fortunate enough to purchase from you is a perfect match for my 15" f/5. At the Mid Atlantic Star Party in Oct. 2001, the seeing was exceptional one night, and Saturn was really rockin at about 600 power. I would never have been able to see it so clearly without the platform." "I love the platform. I'm long winded. I put up the scope and we started out with M13. Having been Platform-less since November I have gotten used to observing sessions with the scouts going something like this: Aim at object, check in low power EP, run down ladder, get one maybe 2-3 kids up to see object before one says "I don't see anything", run up ladder, recenter ... repeat. I switched on the platform and set it. I aimed at M13. I checked in the EP. I told the kids to first look in the finder (80mm Orion Short Tube mounted on the UTA) and then in the telescopes EP. One scout goes up the ladder, then another, then another, then a leader, then a mother, then a scout ... I begin to wonder what they are looking at. I keep thinking I must go check in the EP but the line is long and I hate to interrupt. Only by watching the kids and listening when they look in the EP could I reassure myself that it was tracking. The response was the same. Look in the finder ... do you see it ... fuzzy yes good ... now look in the EP ... "WOW". This happened again and again and again. Finally I could stand it no longer, I butted in line (well it is my scope), ran up the ladder ... "WOW" ... there it was M13 - still in the EP. Thanks. Platform works great." 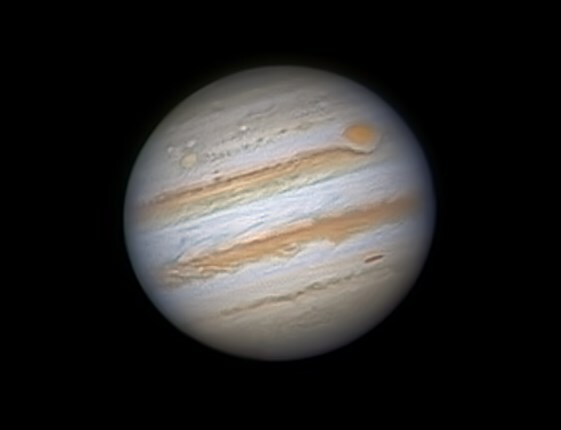 " I had a decent sky a few nights ago, and the Compact Platform tracked beautifully. I just kept leaving and coming back later, and it was always still there. Some kind of magic that stops the earth from turning, I suppose...! It's also quite beautiful (see photo). You really did a great job. It's more compact than I expected, and is a real class act. " "I would like to comment on the purchase of the Dual-Axis Equatorial Platform for my 25" f/5 Dobsonian. I've been a serious deep-sky observer for nearly 35 years. For the past 15 years, I've been using a 12.5" f/6 Newtonian mounted on a Byers 812 equatorial mount. The long-discontinued Byers has always been a delight to use. When I was ready to move up in aperture, there was little option other than a Dobsonian. The new 25" telescope performs superbly. Objects are 4 times brighter than in the 12.5". But there's one serious drawback: the lack of having it equatorially driven. A few months ago, I decided to buy Tom Osypowski's Equatorial Platform. I am able to set the telescope on top of the platform single-handed in a matter of minutes. I was a bit dubious about how well the unit would perform. Let me say it is worth every penny of its cost. I simply aim the center-line of the platform toward Polaris for initial setup, flip the switch, and presto, I now have a giant telescope that can track the stars. My first test was Saturn. At 200x, it remained frozen in the center of the field of view, even without careful polar-alignment. At 360x, it still remained in the field of view for 15 minutes or so. The next night, I was a bit more accurate on polar aligning, and tracking was as accurate as my Byers mount. Can one see a difference with a telescope that tracks the stars? You'd better believe it! I am able to instantly see the central star in the Ring Nebula. I had seen it before but not as easily as I can now that I don't have to battle the constant drifting of object across the field of view. As an avid planetary nebula observer, I enjoy examining a star field at high powers without having to re-center the suspected planetary. Last night, while observing NGC 2392 (Eskimo Nebula) in Gemini, I was able to use a 6mm TeleVue Radian eyepiece yielding 529x. The detail in the nebula was as I've never seen it before. I then tried a 2.5mm Lanthanum eyepiece at 1200x! It's a cinch to center the object at such high powers using the slow-motion controller included with the Platform. The nebula practically filled the entire field of view and remained centered as I studied the intricate detail. M42, the Great Orion Nebula, is a sight to behold in a 25" telescope at 300x. I am able to see not only the 5th and 6th stars within the Trapezium (stars E, F), but also the 7th and 8th stars (G & H) as well. Prior to using the Equatorial Platform, I have never seen these two stars. What amazes me is the compactness and quality of engineering of the platform. How did I ever live without it? And it raised the already tall telescope only 7", not all that objectionable. The stability of the telescope is virtually identical to using it without the platform. Lately I have read about the availability of several home-made, and one commercially-made, GO TO & computer tracking kits for Dobsonian telescopes. The concept sounds intriguing indeed. However, as a serious observer, I can tell you that the idea is better on paper than in real-life use in the field. They slew too slowly for my taste, even at 1000x times the tracking rate. It'll still take 60 seconds or longer to slew to opposite ends of the sky, not to mention the battery consumption of these GO TO units. Tom Osypowski's Equatorial Platform consumes minimal battery power. In fact, the optional rechargeable gel-cell battery generally lasts three observing evenings, even in cold weather when observing up to 6 hours per night. Another advantage is that, with a Dobsonian telescope riding on the Platform, all the motions of the telescope remain the same as without the Platform. Furthermore, there are no gears to engage or disengage. Rather than a GO TO unit, I much prefer to use a Dobsonian fitted with standard digital setting circles on the Equatorial Platform and manually move the telescope towards the deep-sky object until the digital setting circles count down to zero. What could be more simple and foolproof? I can slew to opposite ends of the sky in less than 5 seconds, much faster than any motorized GO TO telescope. If the battery in the platform should die, you can still use the telescope as you normally would, albeit without the drive capability. 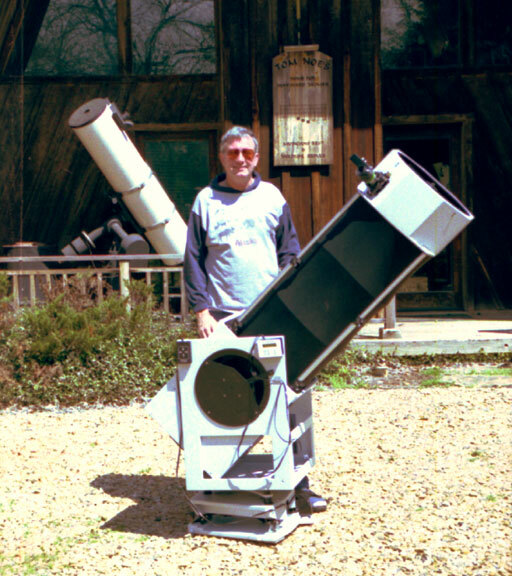 I find Tom Osypowski's Equatorial Platform hardly an accessory for my 25" f/5 telescope. It should be considered a necessity for any serious deep-sky observer."